The broadfork or grelinette is a cornerstone tool for regenerative commercial/human scale farming. A 600mm wide steel base and six 300 mm tynes with light weight wooden handles allows back saving ease to aerate and decompress 750mm wide permabeds in one pass. We use this very sturdy and lightweight bed (forming) prep rake now available from our site, ActiveVista micro-farm supplies in Australia. Great for using after forming commercial permabeds with a Berta plough (as seen below on a walk behind tractor). The bed prep rake lowers and widens the beds to the desired size, before broadforking. 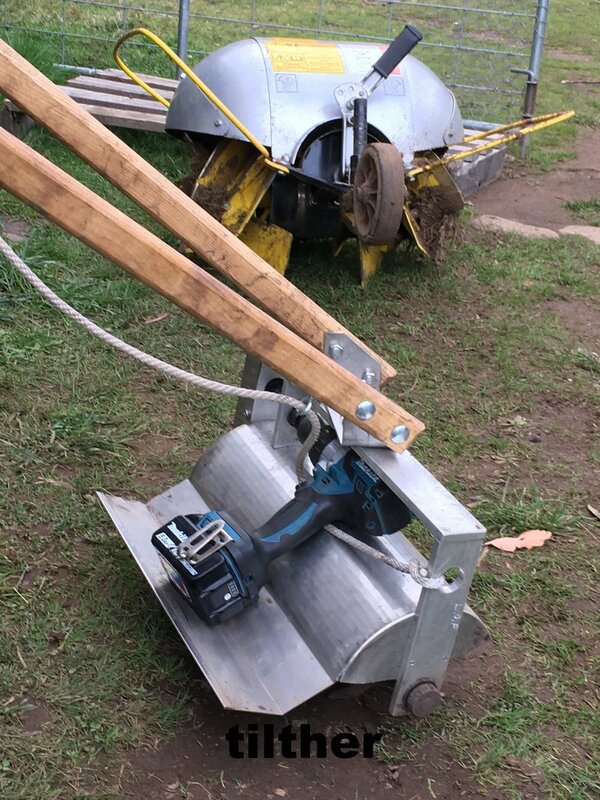 This will allow you to incorporate compost and fertiliser either with the Rinaldi power harrow possible without dragging the fertiliser, soil and compost or with the quiet and compact Tilther. We use the tilther to prepare for intensive (carpet) planting of salads, kales, spinach and other baby leaf crops. Essential for preparing the top 50mm of soil for intensive planting, the tilther creates a seed raising style top layer with the following benefits. Incorporates compost and fertiliser into the top layer evenly..
A joy to use, quiet and drill powered the tilther is great for use in hot houses. Available from ActiveVista microfarming supplies by Longley .Organic Farm.